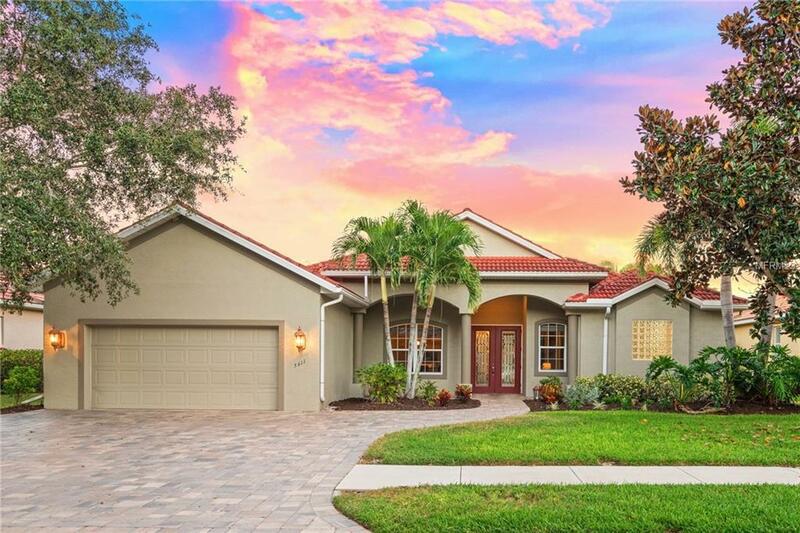 Gracefully poised with lovely lake views in the charming neighborhood of Three Oaks, this exquisite home exemplifies superior quality and gracious Florida living. A flowing and flexible floorplan frames your daily life and extends onto beautiful outdoor areas where water and sky make a stunning backdrop. Enter the double-etched glass doorway to dazzling interiors where architectural upgradesarches, niches, tray ceilings, crown molding, cherry wood flooring, and volume ceilings set an elegant scene. Sunlight sparkles through the oversized windows and sliding glass doors that open to the sparkling pool and an aviary show of eagles, herons, and ospreys. Whip up signature recipes in the gourmet kitchen with granite surfaces, newer GE stainless appliances, and 42 cabinets. Relax in the den, or the bonus room provides additional space for a play or work out room. Five bedrooms and a split floorplan provide privacy for loved ones and guests. The master is spacious and serene with an impressive closet system, sunken tub, and walk-in shower. The piece de resistance is the grand pool terrace with covered paver lanai, and saltwater screened pool and spa with Pebble Tec finish. Universal design principles make the outdoor living area accessible to anyone. Additional items of note: sprinkler system on well water, new Trane air conditioner, plumbed for summer kitchen and alarm system. Three Oaks is centrally located in Sarasota within an A-rated school district, near downtown and Siesta Key beach.